Global Conferences initiates and organizes a range of business events. We organize every aspect of each participant’s week-long visit, from arrival at the airport to taking the flight back home. The format of the business week consists of 5 days of intensive and productive work. Conference on day one includes presentations by leading professional organizations that oversee the sector. These presentations and subsequent dialogue allow participants to gain a full and diverse picture of what is happening in a given sector in a given country. The following four days consist of visits to sector-related organizations. 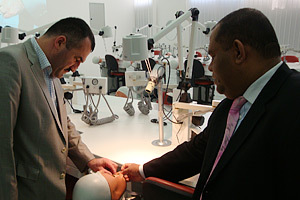 Two to three visits per day are arranged, with presentations by management, followed by dialogue and a tour of facilities. The intensity of the programmes allows participants to meet with more than 30 foreign colleagues in one week and to develop these contacts further on returning back home. In addition to gaining international contacts, participants often also initiate new business projects together. Global Conferences initiates and organizes training courses at world leading universities in areas: HEALTHCARE and EDUCATION. Course length: 10 days (72 hours). Course components: lectures, interactive sessions, visits to leading sector organizations. Training Course for Managers of Higher Education Institutions. In the field of construction, we have business programmes “Development of New Towns” and “Commercial Property Development”. We are proud of the new town and residential area-based projects initiated by architects and developers that met at our business events. The goal of our programmes is to facilitate the exchange of experience and to initiate new contacts between companies involved in designing and developing residential areas, towns and commercial properties at all stages – from developing the initial concept to marketing, sales and after-sales management. Our series of business programmes in the construction sector have so far seen successes in the UK, Spain and China. In the field of education we have a business programme “Efficient Management of Higher Education Institutions”, for university management teams, and “Efficient Management of Pre-University Education Institutions”, for management teams of colleges. We are proud of the cooperation between universities as a result of the exchanges that take place while on our business programmes. Our events in this sector are structured to include presentations by management at universities, followed by dialogue and tours of facilities. Special attention in our events is given to studying issues of international accreditation and the issue of transformation of a classical university into the research university. Our series of business programmes in the education sector have so far seen successes in the UK, France, Japan, the United Arab Emirates, Hong Kong, USA, Australia, Brazil, Switzerland and Singapore. In the field of healthcare, we organize business programmes: “Efficient Management of Medical Institutions”; “Efficient Management of Reproduction Clinic”; “Modern Dentistry”; training course in Healthcare Management. We are proud of the joint projects initiated between participating health insurance companies, and of the experience exchanged and the training gained by the medical professionals who take part in our courses. Our programmes in this sector are structured to include presentations by clinical and hospital management and professionals, followed by dialogue and tours of facilities. Training courses are conducted on the premises of teaching hospitals and include a theoretical section and a practical section according to particular requirements. Special attention in our business programmes has been given to studying issues surrounding the international accreditation of hospitals and clinics. Our series of business programmes in the healthcare sector have so far seen successes in the UK, France, Japan, the United Arab Emirates, Hong Kong, USA, Australia, Belgium, Brazil, Germany, Russia, Switzerland and Singapore.